Bellatrix is the new EPFL computing cluster managed by DIT. Power provisioning and energy consumption become major challenges in the field of high performance computing in several sectors from Education to Research, from Banking to Pharmaceutical. 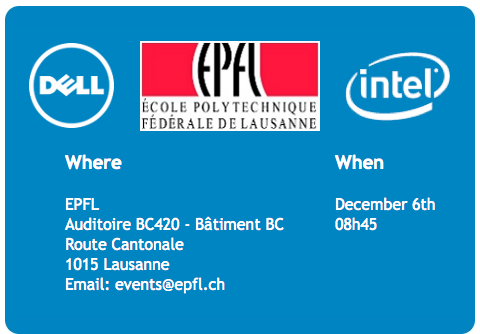 EPFL, together with Dell and Intel, will guide you in a journey through the advantages and critical implementation aspects of HPC. In particular, the researchers from EPFL will present their current work and use of the Bellatrix HPC Cluster. You are welcome to attend the entire event or only the presentations of your interest. The event is free of charge but registration is mandatory. Vittoria Rezzonico looks forward to meet you at the event!